In 2007 the first Smashburger was opened in Denver, Colorado, with one simple notion in mind: despite the overwhelming number of restaurants serving burgers, customers were looking for something better. Smashburger can be found in 9 countries, with over 370 restaurants worldwide, with 6 located in the UK and counting. The first UK Smashburger was opened in 2016 in Milton Keynes. With the British public asking for more, we opened up in locations including Bath. 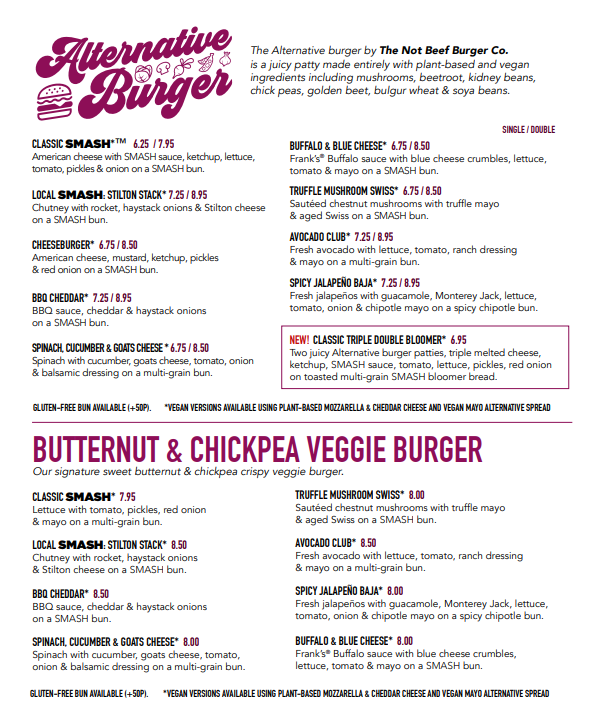 The Alternative burger is a plant based patty made entirely with vegan ingredients including mushrooms, beetroot, kidney beans, chick peas, golden beet, bulgur wheat & soy beans. Available shortly.